We spotted this little chap asleep in the harbour at Moss Landing. The sea was wild – so the harbour was a good choice for a quiet nap. Moss Landing is the home of the Monterey Bay Aquarium’s research fleet, so it probably felt quite safe. More pictures of it here. Subscribe to comments with RSS	or TrackBack to 'Sea Otter (Asleep)'. They really are unfairly cute. When we were in San Diego (many moons ago) we saw a sea otter teaching its cub to open a clam with a stone. 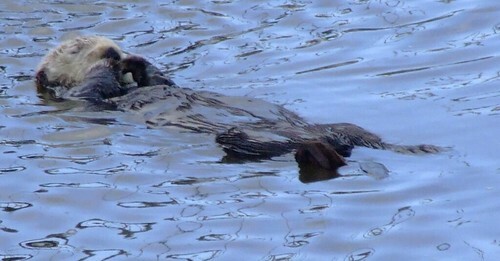 The otter was on her back with the clam on her tummy. The cub was vertical in the water resting its paws on Mum’s tummy and treading water. It really shouldn’t be allowed. cute! i love sea otters…!